Cheap wedding decorations are a must when you being strict with your budget, but they are also very fashionable. More and more brides are looking to have more of a retro look to their weddings and rather than spend a fortune in trendy stores it is more fun to start hunting in your local thrift stores. Plus you will have the real thing rather than a modern copy. Things to look out for are glassware, you could stick with one color glass or have complimentary colors, this way it will look as if you have designed it this way rather than bought a job lot from a garage sale. 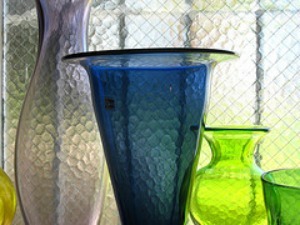 Use these vases as centerpieces for your tables and have small posies of seasonal flowers in each. Thrift store finds for cheap wedding decorations are cake stands, very retro and very on trend. It won't matter that they are all different, in fact it would look wrong if they were. You could have an individual wedding cake for each table on the stand or fill it with fruit and flowers. If you are having cupcakes for your wedding cake then this is a lovely way to display them at every one's table. Bunting is a good look for a retro wedding, just think village garden parties and summer fairs. It is unlikely that you will find yards of ready made bunting but you never know! What you are guaranteed to find are lots of fabric; old curtains, table cloths, bedding - all of these can be used to make bunting from. 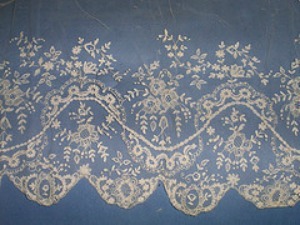 Lace adds a touch of old fashioned romance, look out for old lace curtains and table cloths that you can fashion into table runners. Use cheap colored table cloths as the under cloth and then have a lace runner on the top. Lace looks great on a top table with ivy mixed in, don't forget ivy means wedded bliss and it is so readily available you probably won't need to buy it. If you are catering for your wedding yourselves then you will need lots of crockery and glasses for your guests, if there are a lot of you rather than buy them you will want to hire, check out your local yellow pages to compare prices. There are also a number of vintage crockery hire companies that have started to cater for vintage weddings. If you are thinking of hiring a local community hall it is worth checking out their crockery - I bet there are some vintage gems at the back of their cupboards if they are anything like the ones near us. 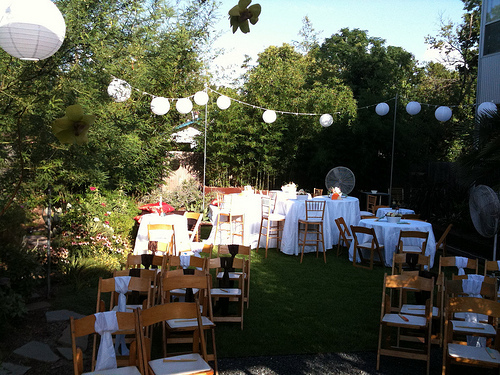 A backyard wedding looks lovely however you decorate it. There is something so intimate about having your day in a place that is so special to you. And although paper lanterns are not particularly vintage - they do look pretty. If your wedding is smaller and especially if you are holding an afternoon tea party as your reception, keep an eye out for cups and saucers and teapots at your local thrift stores. Make sure you also ask friends and family if they have any that you can borrow so that you can keep your costs down. Again don't worry if it doesn't match, this is part of the charm, team up crockery that looks good together for each table. You could even theme each table as a color and then have crockery of that color. 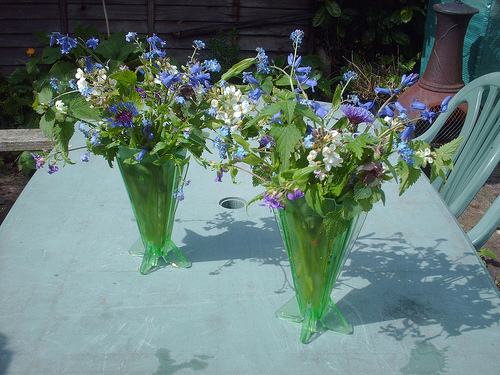 Combine lots of local and in season flowers, ones that are being grown in your families and friends gardens would be perfect - make sure you ask first before you take them! If you are super organized you could give seeds of flowers that you want as part of your cheap wedding decorations and ask family and friends for them to be grown as part of the wedding plans. Hunting in thrift stores, yard sales, jumble sales and car boot sales is good fun, go with an open mind and don't have a set plan of what you want as you may never find it. Instead have an idea of how you want your reception to look overall and buy to fit that dream.